Kontakt | Theaterbündnis Blumenstrauß e.V. und nach Verabredung gerne auch zu anderen Zeiten! Wir sind „fast“ barrierefrei, bitte am Eingang 2B klingeln (Theater) oder anrufen, wenn ihr Hilfe braucht, um die Rampe hochzukommen oder so. 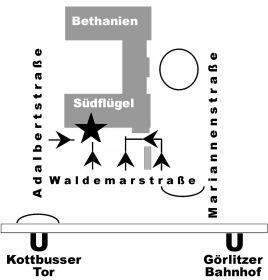 U1/8 Kottbusser Tor, Bus 140 Adalbertstr./Waldemarstr., Bus M29 Oranienstr./Adalbertstr. Coming from Waldemarstrasse take the foot path between the playground and building Nr. 57 and walk straight towards the terrasse with our poster. If you need to transport or deliver something by car/truck, please let us know beforehand to give you instructions. You find the entrance of the driveway into the park at Mariannenplatz, next to the church.